The 2017 Ram 1500 is a light duty truck that has many ways to be configured for the average consumer. Be it the trim, the engine, the cab size, or the truck bed, there’s something for every truck driver. Plus, it’s got great handling and style that sets it apart from other trucks. It’s hard to mistake a Ram on the road. The 2017 Ram 1500 has several engine choices as it does cab sizes and truck beds – three. It also has 2×4 and 4×4 drivetrain. Starting off, there’s the 3.6-liter Pentastar V6 24-valve engine, designed with VVT engine technology to increase engine performance and fuel economy. It generates 305-horsepower, 269 lb-ft of torque, and has a fuel economy of 17/25 mpg city/highway. The next engine is the 395-hp 5.7-liter HEMI V8. The 5.7-liter HEMI engine is strongest engine in the lineup and can get the heaviest work done. The second strongest is the 3.0-liter V6 EcoDiesel engine, which was named by Wards on their list of “10 Best Engines” for three years in a row. It produces 420 lb-ft of torque and 240 horsepower, and has best-in-class highway fuel economy of 29 mpg. Towing power relies heavily on torque, and typically larger engines will offer more torque and higher towing capacities. The 3.6-liter V6 engine has a towing capacity of 4,850 to 7,300 pounds. The strongest of the three engines, the 5.7-liter HEMI V8 can pull anywhere from 8,550 pounds to 10,700 pounds depending on how it is equipped. The EcoDiesel engine has a towing capacity between 8,050 to 9,050 pounds. Keep in mind, these towing capacities are dependent on a variety of truck specs including cabin size, axle ratio, and bed length, not just the engine. Yes, the 2017 Ram 1500 comes in three different cab sizes and three bed lengths. The cabins can be the regular cab, the popular crew cab, or the quad cab for something a little larger. Of course, the crew cab can’t get the 8-foot truck bed, limited to the 6’4” bed. The 6/4” and 8’ bed is available to the regular cab, and a 5’7” bed plus the 6’4” bed is available for the crew cab. Some nice exterior features come with the 2017 Ram 1500. Automatic headlamps are a lineup standard, whereas LED bed lighting is available, not standard. One of the options that is a popular favorite is the RamBox Cargo Management system, which is two exterior storage compartments on both sides of the truck bed. The storage compartments also double as a drainable cooler. Throw on some side-steps and available 22-inch forged aluminum wheels, and you’ve got a lot of style, my friend. The inside also has some nice options and features, all depending on trim and specs of course. However, 40/20/40 bench seats are common for seating arrangements, and behind-the-seat storage bins can be found on the Tradesman and Express trims. For a little luxury, heated front seats become available starting with the Lone Star trim. Convenience is also found on the inside of this Ram truck. For starters, an electronic vehicle information center is standard across all trims, as well as a rear sliding window. Buyers also have the option of some more upscale features, like rear under seat storage compartments, a rear folding seat, and a 7-Inch Rebel Reconfigurable Instrument Cluster. The standard audio system is a 6-speaker system, but drivers can upgrade to nine Alpine speakers with subwoofer, if they desire. A 5-inch touchscreen display is available on the base trim, and an 8.4-inch touchscreen is standard on the rest of the lineup. For keeping an eye on truck components and performance, a 7-inch multi-view instrument cluster is also standard on all trims after the Express. GPS navigation and integrated voice command with Bluetooth are standard on the Lone Star, Big Horn, and Sport; on the Tradesman and Express, it’s an add-on option. Radio 3.0 is only available on the Tradesman and Express; commonly known as Uconnect 3.0, a variation of the audio system that keeps it simple, offering AM/FM, auxiliary and USB connectivity, mobile connectivity, and Speed Adjusted Volume. Uconnect 8.4 and Uconnect Access come standard on the rest of the lineup, so no biggie. All trims have a media hub with USB and auxiliary connectivity. All of the usual safety features come on a 2017 Ram 1500 – advanced multistage front airbags, supplemental front and side-curtain airbags, and a Sentry Key theft deterrent system throughout all trims. Standard on all trims but the Tradesman and Express (optional here) is a ParkView Rear Back-Up Camera; Remote Keyless Entry with All-Secure comes standard on the Lone Star, Big Horn, and Sport trims. 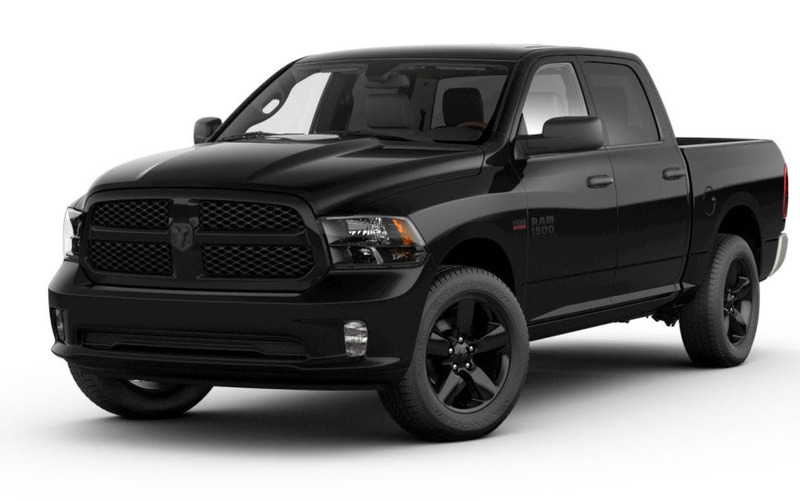 All 2017 Ram 1500 are covered by a basic 3-year/36,000-mile warranty, a 5-year/60,000-mile powertrain warranty, a 5-year/60,000-mile warranty on gas engines, roadside assistance for 5 years or 60,000 miles, and rust-through coverage for 5 years, unlimited miles.